Learn how to make unique stamps based on your own designs. These stamps will have super thin and super tall walls, so they will be great for many different polymer clay techniques: back-filling, mokume gane, cutting, carving, raised design, and more. The cost of materials for each stamp varies from zero dollars to less than a dollar, depending on what option you will choose. As for the tools, you really need only a pair of wire-wrapping pliers. A few other tools listed in the tutorial are optional and may be replaced with those that you already have in your craft room and in your home. 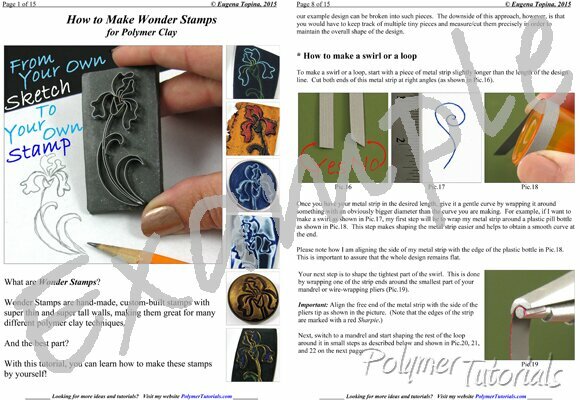 You can see examples of my jewelry pieces created with these stamps in the example page picture (below) and in the pictures on the right. Place a mouse over the small pictures to see them enlarged.